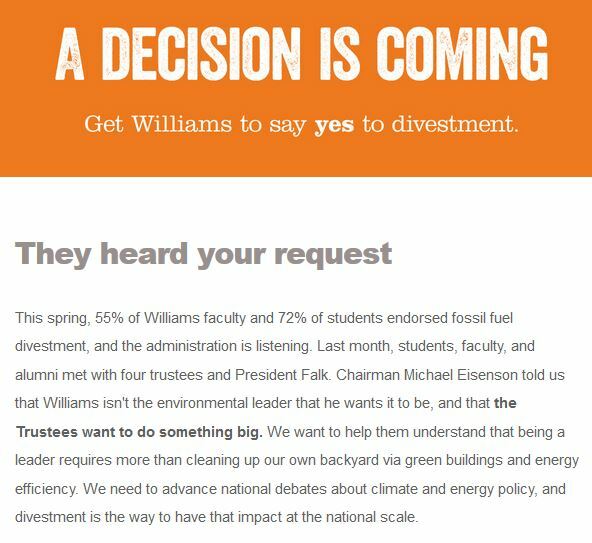 Currently browsing posts filed under "Divestment"
Even if you disagree with the goals of the Divest Williams effort, you have to admire their commitment and moxie. 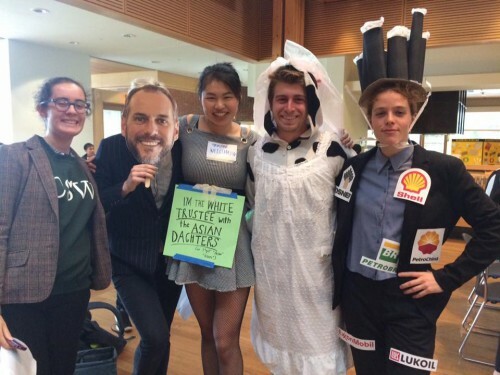 On Friday, Divest Williams staged a mock wedding between the College and the fossil fuels industry to protest the College’s investment in that industry and call for divestment from it. The wedding, which was attended by roughly 150 students, faculty, and staff members, followed mock weddings staged over the past few years by divestment activists at Whitman College and the Universities of Washington, Montana and Oregon. Max Harmon ’19 played the part of the bride – the College, wearing a cow costume and veil. Linda Worden ’19, dressed as President Adam Falk, escorted him down the aisle. In front of them, Phacelia Cramer ’19 scattered fake hundred dollar bills like rose petals. Lili Bierer ’19 played the groom, representing the fossil fuels industry by wearing a suit adorned with the logos of large oil and gas companies and a tall hat made of smoke stacks. The bridesmaids included Haley Bosse ’20, MaKaila DeSano-Smith ’18 and Suiyi Tang ’19, dressed as Michael Eisenson ’77, O. Andreas Halvorsen ’86 and Martha Williamson ’77 — three members of the Board of Trustees. The Board announced in 2015 that it would not be divesting from fossil fuels. Halvorsen stated at this year’s open forum with the trustees that the matter was a closed issue. Is Divest Williams really going after Martha Williamson’s ’77 daughters? That is unbelievably rude. If I were Dean of the College, I would have a few choice words for Suiyi Tang ’19 and the rest of Divest Williams. The children of fellow Ephs are off-limits — whatever the depths of your disagreements may be. 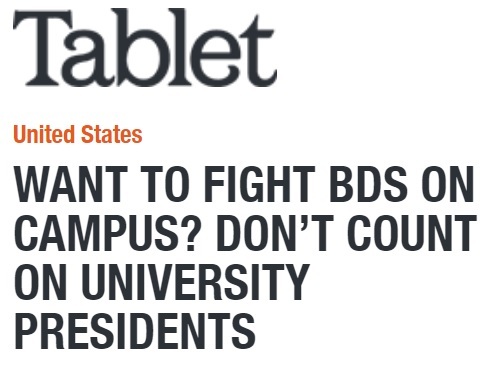 Of course, the College should (would?) never punish a student for engaging in free speech, but an education in the costs/benefits of such tactics would be useful. There is no better way to get the trustees to ignore you forevermore than to go after one of them in such a personal way. Is there some backstory here? Did Williamson, in a previous meeting with Divest Williams, mention the race of her daughters? Haley Bosse’s ’20 costume was also . . . edgy . . . in a way that she might not have realized or intended . . . Useful overview from the New Yorker. Exactly right. Who don’t more people in favor of Williams divesting from X or Y or Z — I lose track of the current issues du outrage — understand basic economics? Here is the summary (only?) document regarding the College’s recent announcement of its plan to address climate change. The Record has not covered itself in glory the last few years with regard to these sorts of announcements, often failing to quote (interview?) critics of Williams or to even ask any hard questions. So, let’s help the Record by suggesting some questions it should ask. (Reader suggestions are also welcome in the comments.) Block quotations below are from the document, followed by suggested questions. The initial cost of divestment would be in liquidating the portfolio which, even done in an orderly fashion over the course of a year, would cost $75 million or more. Will the College share the details of this calculation? Many members of the community find it to be absurdly high, given that the vast majority of investment vehicles that Williams participates in have no coal holdings and are happy to certify this fact. Make anthropogenic climate change a campus-wide theme of inquiry in the 2016-17 academic year. Will Williams include all sides to the debate as part of this programming or will the College only invite speakers and/or stage events which reinforce your claim that “global climate change is an urgent issue and that Williams has an obligation to address the issue in substantive ways.” For example, many people (including many Ephs) believe that there are many policy issues more important than climate change. Others argue that elite colleges like Williams should focus on their educational mission without being distracted by contentious issues of public policy. Is Williams committing to transparency in providing details to the community with regard to these investments? A political and ecological crisis of this scale demands the leadership that the Williams community can offer. You claim that you and the trustees agree with this statement. If so, will you and the trustees agree to the demonstrate a minimum amount of personal leadership/responsibility by, for example, not engaging in private air travel? It is hard to take serious anyone who claims to be concerned with carbon emissions but who, at the same time, takes part in just about the most carbon producing individual activity possible. On the those same lines, will you agree to start using the Williams President’s House? As you know, you are the first Williams President for more than 100 years to insist on living elsewhere. Given that housing is one of the biggest ways that individuals contribute to carbon emissions, it is fair to say that you, personally, contribute much more to carbon emissions than your predecessors. Why not show some personal leadership and only have one house? It is hard to take serious the claim that climate change is a crisis until the people who say that it is a crisis start acting like it is a crisis. In 2007, the college committed to a goal of reducing its greenhouse gas emissions to 10 percent below 1990 levels by 2020, and we are 75 percent of the way there. Will you commit to better transparency with regard to the College’s greenhouse gas emissions? Many people doubt whether this claim is, in fact, true. Where is the data to back it up? Indeed, given that the College has many more larger buildings and employs many more people now than it did in 2007, how could it possibly be that greenhouse gas emissions have gone down so far? [W]e will then seek to take the further step of achieving net carbon neutrality for the college through the incremental purchase of carbon offsets on the global market. The College participated in purchasing carbon offsets back in 2007. Many observers believe that this was a failure, bordering on fraud. Have you checked whether the College spending at Owl Feather War Bonnet Wind Farm and the Wanner Family Dairy Farm Methane Project actually resulted in carbon reductions? Has anyone? If not, then why would we expect new purchases to be any more effective? This should be enough material to get the latest set of Record reporters going. Please try to do more than simply reprint the College’s press release. Not sure if this link will work, but below is the key message. The Williams Investment Office is charged with managing the endowment in order generate the most returns with the least risk, consistent with legal requirements and ethical norms. No account is taken of contemporary policy debates concerning climate change, Palestine, child labor, racial justice, or any other issue. 2) Did Eisenson really say that the “trustees want to do something big?” That would be a strange thing to say unless he and the trustees had already decided on what they wanted to do. It is also strange that the ACSR’s report would be so balanced — not endorsing divestment nearly as strongly as it could have — if major action was in the works. 3) Predictions? I don’t know. Judging by the tone of the ACSR report, and the fact that places like Harvard have strongly resisted calls for divestment, I was expecting no policy change. But Eisenson is a smart and powerful Eph. I would expect him to not even take that meeting, much less mention “something big” if the plan was to maintain the status quo. Below the break is the recent divestment letter to Adam Falk and the trustees. Original is here, but we save our own copy for the benefit of future historians. It is week. Should I spend two weeks critiquing it and the more detailed Williams Divestment Proposal? Given the broad interest in the work that the Advisory Committee on Shareholder Responsibility has been doing to analyze the proposal that the college divest from 200 companies involved with fossil fuel extraction, I thought I’d let you know that the committee’s report on the matter is now complete and available online. The report articulates those areas on which the committee reached consensus and those on which after careful deliberation there was not agreement. The Board of Trustees began discussing the report at its meeting last weekend. The trustees’ deliberations, which will continue over the coming months, rest on the premises, which I share, that the climate is changing, that the causes of that change are almost assuredly human, and that Williams must develop a strong and broad-based response. For now our thanks go to ACSR Chair Anand Swamy and the whole committee for their thoughtful work on this important issue—work that has modeled how people with differing viewpoints of how to achieve a shared goal can engage with each other in ways that are both vigorous and respectful. Third, there is much material in the report worthy of discussion. Who wants to see a 10 day EphBlog critique/discussion? Fourth, as always, the underlying politics are interesting. 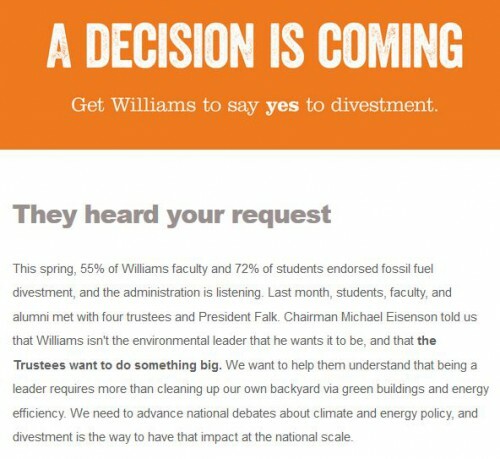 I suspect that there are powerful forces at the College who do not want divestment and have pushed hard against it. Why else would the Investment Office go to the trouble of writing an op-ed in the Record? (By the way, this op-ed is filled with lies-by-omission. With luck, it will only take 5 days to unpack them.) Comments by insiders on the internal politics of divestment are welcome. EphBlog is powered by WordPress and delivered to you in 1.510 seconds using 35 queries..